We offer the following test kits to provide you the materials and information you need to become a qualified welder in accordance with AWS D1.1 Structural Welding Code-Steel. 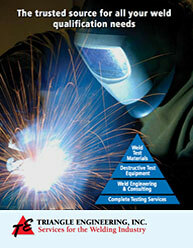 This performance qualification is a specifically devised test to determine a welder’s ability to produce sound welds. Each kit contains: Welding instructions, positional drawing(s), mill test reports, welder qualification form, shipping form, plates, electrode, and backing for practice and test. 3/8″ test plate qualifies for 1/8″ to 3/4″ thickness, as well as fillet welds 1/8″ and greater on plate, pipe or tubing. 1″ test plate qualifies for 1/8″ to unlimited thickness, as well as fillet welds 1/8″ and greater on plate, pipe or tubing.